The Keywords Meta Tag, and the current discussion around it, is one of the major dislikes in the web design world (other than trying to make websites look good in every version of Internet Explorer, that is). The keywords meta tag has not been supported by the major search engines since 1997, yet people to this day obsess over it and some people actually base their sales pitches around it. This obsession is likely caused by a confusion between a page’s keywords and the keywords meta tag. So what’s the difference between keywords and the keywords meta tag? A page’s keywords are the words that are found in places of importance throughout the page, and what search engines will use to determine what your page is about. In contrast, the keywords meta tag is a reference to the HTML code. Although the keywords meta tag was created, no specification was ever set for it, even after all of the major search engines at the time met in May of 1996 to discuss a specification for it. Out of these seven search engines, only Infoseek and AltaVista offered support for the keywords meta tag. AltaVista dropped its support of the keywords meta tag in July of 2002. 1998 saw the emergence of new search engines, most notable of which is Google. 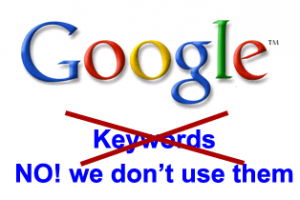 Google has NEVER supported the keywords meta tag. Although Google will read the contents of the tag since it is part of the HTML document, it does not give any consideration to the contents of the tag. To read more from Google, click the button below. Why doesn’t Google, Bing, or Yahoo! give consideration to the keywords meta tag? The reason is simple: in the early days of the internet, before there were the advanced search algorithms that exist today, the search engines judged web pages solely on the content they contained. Web designers desiring to get their pages found would often stuff the keywords meta tag full of keywords, many of which were irrelevant to the content of the web page. This practice is one form of keyword stuffing. This kind of abuse is why the meta tag is not considered today. Using the keywords meta tag for common misspellings or unusual words MAY help you page get found, but no consideration is given to your page due to the tag, these keywords will aid in retrieval of the page only. The best way to register your keywords is by creating a strong, keyword rich title tag for each page that reflects the content of the page. Additionally, you should use the keywords that reflect the content of the page in natural sentences on the body of each page. Today’s algorithms are more advanced and can detect if the keywords are in a natural sentence or not. So it is imperative that your content be well written and not a garbled mess of keywords. This page is a good example of using your keywords in your content. The focus of this post is to explain why the keywords meta tag is not considered in search engine algorithms today. This post was written naturally and the keyword phrase “keywords meta tag” has been mentioned fifteen times to this point, without using keyword stuffing or seeming out of place. If you, or the company you hire to, use this strategy when designing your website’s pages, your website will enter the world search engine friendly.